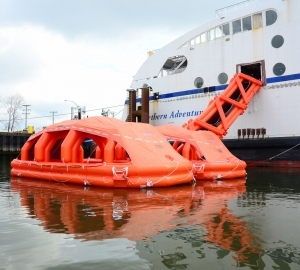 On Tuesday, 28th February 2017, a successful deployment test of a LSA 14M MES (consisting of a 14-metre evacuation slide with a 100-person Self Righting Liferaft) and a 100-person “Link” liferaft was conducted from BC Ferries vessel MV Northern Adventure. The deployment was conducted at BC Ferries refit yard in Richmond, British Columbia, by the ship’s crew who demonstrated proficiency in the newly installed equipment. The test was witnessed by Lloyds with 8 people descending the MES.